Our Funarena! 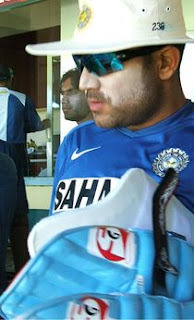 : India Win The Second Highest Scoring Cricket Onedayer! India Win The Second Highest Scoring Cricket Onedayer! The first match was between Australia Vs South Africa. Aus made 434/4 and SA won the match by making 438/9! Total 872/13. Today India made 414/7 and Sri Lanka lost the match by 3 runs at 411/8. Total match score 825/15. India made the highest ODI total of 414 and yet just managed to win by 3 runs. Sri Lanka was cruising for a superlative victory needing just 22 runs off 18 balls with 5 wickets intact. But, Zaheer Khan and Ashish Nehra bowled incredible last overs and the fielding, for a change, was excellent too. The positive--India won a close match by holding on to the nerves in the dying moments. Managing to win was much better than managing to lose which, in this case, was so blissfully easy or rather made easy by some glorious batting by Sri Lankans. A twist in the end! Well, Indian cricket Board officials while making lifeless pitches for an entertaining shower of fours and sixes just forget that the opposition team too can capitalize on this and when they indulge in the fours and sixes act the big crowds become ominously silent and gloomy! Better, officials should concentrate on making competitive pitches that educate the crowds about the inner nuances of the game of cricket so that they can still enjoy irrespective of who win or lose. Anyway, it was a rare treat of cricket match. A suspense thriller till the last minute and a match where it hardly mattered who finally won. If Virender Sehwag and Tendulkar and Dhoni produced spectacular shots, Dilshan Tilakratne and Sangakkara and Tharanga did fittingly too.